Back at the office things had been moving along in a normal fashion. Or what Claire had come to think of as normal. Spending her time as a holder of space on the couch in her little room, thumbing through those travel magazines, glancing off from time to time at the typewriter on the desk with the stack of paper sitting beside it, that was how a normal day started here. It didn’t seem to be important that Claire actually use the old-fashioned typing machine – although it did seem to be calling to her on some level. The paper that was stacked in the pile was still blank as she hadn’t typed a word since she started sitting here. Omi had never asked to see her work. And as Claire sat there, she suddenly realized that if someone had asked to see her work, she wouldn’t have anything to show them. She wouldn’t even know what to show them. It’s like she was here to do something particular, but that particular thing was not named. And so, she held the space. Claire thought that it might be more important for her to be ready for the seemingly random trips to the train station. Claire looked out the window at the strange kind of daylight that seemed to be the normal kind of daylight here at the office, but was barely able to made out the back of the building across the alley through the light’s glare. “You know what to do,” said Omi, smiling as he nodded his head in a way that affirmed her adept ability in picking up a total stranger arriving at the local train station. Yep, easy-peasy, just look for the person carrying the red carnation. Just as Claire thought that, her brow furrowed and she wondered why was there only one person with one red carnation at the train station when they went there? Claire started to get up off of the couch, being slowed down by the pulling of the back of her thighs off of the sticky vinyl cushion. Once she was up and standing, she walked over to the door where her tunic now hung on a hanger suspended from a coat hook. Claire took it off of its hanger and slipped it over her head. The tunic isn’t actually like a dress. When put on correctly it was more like a loose wrap around long shirt that ties on the sides, similar to the robe of a Zen monk, or maybe one of those old fashioned wrap around dresses, but much lighter and airy. Everything was lighter and airier here. Being lazy, Claire had just let the ties remain loosely tied and slipped the garment on and off over her head when she need to. Which is exactly what she was doing now as she left the office on this particular errand. Claire made her way down the stairs and out the door and into the alley. The roll-up door to the noodle joint was closed. It was not quite a fifteen minute walk out to the station, so Claire had a little time on her hands. Although, since this was the first time that Claire would be going to the station by herself, maybe she should take care and shouldn’t let her attention wander. But, on the other hand, she had never really had the chance to explore the shops along the way on their previous trips – and exploring was one of her favorite things to do. She tucked into the small grocery up at the corner to purchase a few simple items for the kitchen – a bag of rice, a few bottles of water, and, wow, a handful of chocolate bars – the dark ones. Putting her purchases into her messenger bag she set off again. As Claire walked down the street the bright colors in the shops blended and contrasted with the neutral colors of the people walking through the streets. Claire passed by a garden shop that caught her eye. Claire loved plants, and the green of growing things. She had a number of plants upstairs in her studio. Claire entered the shop, with the plan to just stick her head into the nursery, but once inside she had to look around. Inside, the shop utilized the natural humidity and heat of this area. The shelves were covered with potted ferns, orchids, hibiscus, little palm trees in clay pots, and just being in the room made her feel cool and refreshed. How odd about that though, because the weather inside this nursery was not really any different than the weather outside … but the air inside was noticeably fresh. As Claire walked around she spied a rack of seeds. She loved to look at the pictures on the seed packages and imagine the tiny seeds inside becoming the plants in the pictures. Carrots, broccoli, spinach, herbs, all edible plants. Claire had always wanted a little window garden. Maybe now was the time to start planting one. She picked out a bunch of seed packets, more really than she could use, and paid the woman at the counter on the way out. Now, no more stopping! The point was to to head directly for the station, even if she did get there a little early, it’s better than on time – or late. Missing her first solo connection was not on today’s agenda. As usual, the station was crowded with people, their bodies ebbing and flowing along the platforms, going here, gong there. It took a little while, but not long after her arrival Claire spied the red carnation. It was being carried by another man, similar, yet different to the man they had met the other day. She smiled silently and took the man by the hand and led him out of the crowd and onto the road back into town. They walked in silence, as others walking in front and behind them were doing, but Claire held his hand, mostly so he could feel connected, grounded. There was something about him though that Claire found familiar. “What’s your name?” Claire asked him with a bit of trepidation on her part, not sure if it was the right thing to do, but she was curious. Sometimes, maybe, she didn’t know for sure, the best way to get the new arrivals out of their disorientation was to start asking them simple questions, as if they were coming out of a coma. He looked a little confused, then said, “I’m, I’m not sure …”. He had the presence of mind to stick his hand in his messenger bag and pulled out a piece of paper. “Isn’t that funny? On one hand, I can forget my name but on the other hand I can remember that it was written on a piece of paper in my bag?”, he looked quizzically at her, as if Claire looked familiar in some way and he was trying to remember where he had seen her face before. “Peter. That’s my name, Peter,” he said, puffing up a little, kind of proud of himself and smiling as he did so, as if he had just given her the correct answer to a really absurd question. Hmm, Claire thought to herself, that sounds like an appropriate name to me too. Claire let those thoughts pass through without mentioning it out loud. “OK, well, we are going back into town. I’ll introduce you to Omi and get you settled into your room at The Center.” Claire tried to talk to him as matter of factly as possible so that he would feel like he belonged with them already. He still had her hand in his as they walked all the way into town, passing the fields and the homes with the terra cotta solar roof tiles. As they got closer to the hubbub of the town streets, Peter couldn’t seem to pay attention to where he was going. The colors and crowds were a distraction. Everyone who saw his red carnation bowed slightly to him as he passed, and if their hands were free, they placed them together in an Anjali Mudra, a gesture of greeting and reverence, made by place the palms together at the chest with the the thumbs touching the heart. Peter felt compelled to return each and every one of these gestures. “Come on,” Claire said with a chuckle. “There will be days and days to explore town after we get you settled.” They wound their way through the market stalls and made their way to the alley and then to the door of their building. The noodle joint looked like it was just opening for the afternoon, its roll up door opened half way. Peter looked up at the upper floors of the building, like he was looking up at a building he already knew very well. Shoving open the door, they entered, and climbed the stairs up to the third floor. They walked down the hall and instead of just going into her office, Claire took him to Omi’s room. “Here he is! I have successfully completed my mission!” Claire burst out as they entered the room and she gave a little bow. Omi stood and raised his hand to shake Peter’s. There was something familiar between them, something about the way they greeted each other. Claire was sure that Omi knew what the connection was and Peter was still just a little confused, but he went through the motions. Sometimes going through the motions will trigger a memory. And trigger them it did. “I’m really excited to learn a little more about those solar roofing tiles that I noticed on our walk and doing a little research on water conservation while I’m here. I think the tiles will come in handy for our next building project at the compound …” Peter suddenly took off like a bullet. He was definitely here on business. Now Claire was the one to be confused. What the heck was this guy talking about? It’s like he had an epiphany as they arrived here. Compound? This was her first time spending the first few moments with a new arrival, so this experience was a new one for her. Omi’s office was similar to hers, yet sparser. He had two stuffed chairs and a little hand-woven carpet with a Tibetan cloud design on the floor in front of them. 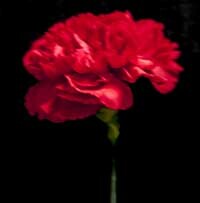 There was a small table against the wall, between the windows, and on the table was a vase of red carnations. Claire took a moment and let her thoughts run through her head, remembering the things that Omi had told her. Red carnations are not just flowers. Red carnations have special meaning. All I’ve seen of the people who carry them is confusion. Why would I want one? Omi stood patiently, smiling, holding the vase out to Claire and waiting. It didn’t seem like Claire had a choice, and she didn’t, really. Both Omi and Peter smiled, Peter gave a wink as well, as Claire chose a red carnation and pulled it out from the vase. Instantly Claire felt herself being pulled backwards, out of the scene, as if someone had come up behind her and grabbed her around the waist, enveloping her in an energy field. Then there was a feeling of disorientation and a whoosh, and, she was gone.